Julia's Cards: Time For BARGAIN Shopping!! 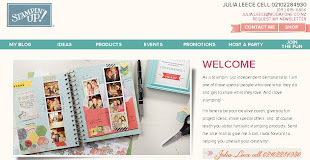 There are some FANTASTIC shopping to be had with Stampin' Up! at the moment. The above photo is the specials on out Weekly Deals which started TODAY and will be available till next Tuesday. The below photos are from our Clearance Rack - these are updated when things sell out or new items are added. Let me know what you'd like me to order TODAY!